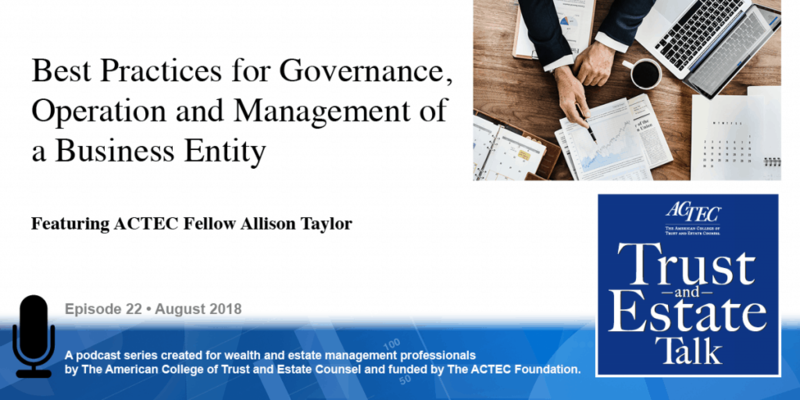 “Best Practices for the Governance, Operation, and Management of a Business Entity.” That’s the subject of today’s ACTEC Trust and Estate Talk. This is Susan Snyder, ACTEC Fellow from Chicago. Once a partnership, corporation, or LLC is set up, what comes next? To answer that question, you will be hearing today from ACTEC Fellow Allison Taylor of Birmingham, Alabama. Welcome, Allison. Thank you very much, Susan. So, I’m going to start with why best practices are important in these organizations. Often times, we represent very closely held or family-owned businesses, and sometimes clients don’t always appreciate or understand the formalities or the benefits of formalities in entities and also the best practices related to those. So, I’m going to give you four reasons why best practices are important. One is that it improves the quality of the business decisions and operations of the company. More and varied perspectives tend to lead to more thoughtful decisions. A process of including a specific group for making those decisions tends to bring consistency to those decisions and also, a level of transparency provides a basis for communication and actually creates a record to some extent. The second reason is that it increases the appeal and the value of the business. So, should a transaction to a third party ever be in an organization’s future? Of course, well-run businesses are always more appealing to prospective purchasers, and in my experience, purchase price and risk allocation is always reflective of how well or not well a business has been run. The third reason why best practices are important is risk management. And so, typically, in an organization that has not followed some best practices – there’s not good records; there’s not good recollection of who made a decision or why a decision was made. Often times, there’s not supporting information to support a position that the organization could be taking in a tax audit, for example, or some other regulatory investigation. So risk management is certainly a benefit of many of these best practices. And then fourth, and I made it fourth intentionally – preserving the limited liability protection of the entity. And I put it last, because I really believe that the first three reasons are the reasons that we should encourage our clients to engage in best practices, and the fourth one is kind of a last resort; we can threaten them with loss of limited liability protection. But of course, case law supports, often times, in certain situations where best practices have not been followed; there are no records; there’s been no meetings; it’s not clear what ownership is. All of that can really come up to bite the owners of an organization in particular situations when someone is trying to pierce that corporate veil. And the same concept, we’ve got very well established law now with regard to limited liability companies that have not been around as long as corporations, but those veils have also been pierced a number of times now and so, I think we can transfer that principle to those as well. So exactly what are best practices? Best practices include maintenance of books and records, and this includes your governance documents, your ownership records, meeting minutes of directors, management committees, shareholders, et cetera, and any other formal actions taken on behalf of the entity. In a lot of our closely held and family businesses we take action by written consent in lieu of a meeting; that’s very, very common in my experience. And so, either way is fine, it just depends on whether we need to have a meeting to discuss something or if everybody’s already on board; we’re taking action by written consent. The important part is documenting that and who participated in that. And then finally, in maintenance of books and records, I included delegations, because I think authority is something that gets very overlooked in some of our smaller ownership, closely held organizations. Who has authority to act on behalf of an organization? And if we all roll back to law school, we remember the concepts of apparent authority and actual authority. And sometimes, we may have a representative that has authority – at least under the law – that we, as the principal, did or did not intend. So, be mindful of authority in your organizations. Again, it’s probably a little more formality than many of our clients are used to, but I prefer to utilize formal delegations when a client wants to delegate authority to a party that is not otherwise authorized under their governance documents. Also, encourage them to remember to revoke that when necessary, both in writing and, with regard to apparent authority, the trick is you got to make sure those third parties are aware that perhaps an agent no longer has authority on behalf of the principal. So lingering authority can also be problematic if that’s not handled properly. The second best practice is documenting actions and distributions. And, in doing that, I think it’s important to always sort of go back and revisit your governance documents, and the reason is that sets forth a lot of the procedure for documenting these, you know, who’s entitled to vote on something or whose approval is required, what kind of notice is required, what’s the time period for that notice? And often times our governance documents set forth those items. State law might also dictate some of those things and also may provide a default on many of those items if your governance documents do not address those items. So just be aware of what is needed to be able to take that action or distribution. And then always make sure you’re documenting significant decisions and actions. You know, electing officers, directors are the ones that come to mind. Also, selling significant assets of the company, borrowing, and, again, a lot of these types of actions can be modified in our governance document so with regard to whose approval or who has a right to weigh in on those things. We have some leeway in designing that, and that’s one of the things that we need to be speaking with our clients about. How do you document those actions and distributions? And, again, I mentioned a couple minutes ago, meeting minutes versus consents or written consent in lieu of a meeting. And, what I would say is a few things about that: be mindful of the level of detail, there is an art to the balance of enough detail and too much detail. Remember that those documents are typically discoverable should that ever face the organization. Also, be careful when you are referencing documents. When you reference a document and you attach it as Exhibit A to your minutes it’s now discoverable. When you reference a discussion of a document that was previously distributed before the meeting, it’s perhaps not. And so be careful, and just make sure you’re being thoughtful and you’re advising your clients to make thoughtful choices about what they actually include in the minutes or do not. We never want legal advice included in the minutes; it’s totally fine to just reference that a privileged communication or discussion occurred during a meeting but not reference the topic of that discussion or what advice was given. Also, conflicts of interest: I run into this fair amount with some of the family-owned, closely held businesses. My encouragement is to document conflicts of interest, to lay them out on the table, the person who has the conflict of interest to abstain, to be willing to leave the room for discussion. All of those sorts of things tend to, I think, bring a sense of harmony to an organization as opposed to just not paying attention to that or otherwise overstepping those bounds. And then the third best practice that I want to talk about is checks and balances. And in checks and balances, you have checks and balances that are built into your governance documents via the relationship between your owners and your officers or other management folks, as well as maybe committees, things like that. So you can build checks and balances into the governance operations. Also, certainly in operating companies, you’ll see checks and balances interwoven throughout the organization. And this is where I think authority, that I mentioned earlier, really comes into play, it’s critically important in the concept of checks and balances, and so I would encourage everyone to advise their clients to be aware of that. And then the fourth best practice is my favorite one: “Consistency is Key.” And so there should be a linear relationship from your governance documents to your policies to your procedures and then your actual practices. And I like to say, “You’re better off not having these things if you’re not going to follow them.” So, with that, I’m going to end and turn it back over to Susan. Thanks, Allison, for your best practices on business entity operation.